Today the Digital Skills and Jobs Coalition celebrates its 100th pledge aimed at bringing digital skills to Europeans. Since the launch in December 2016, organisations, government bodies and businesses who are members of the Coalition provided more than 3.7 million online or face-to-face trainings, one million certificates and 9,000 job placements and internships. Over a million citizens became more aware of the importance of digital skills for employability, competitiveness and participation in society through various organised activities. The Digital Skills and Jobs Coalition is a collective effort to tackle one of Europe's biggest challenges: filling IT vacancies. 100 concrete commitments in just over a year is a remarkable result and a sign of the support from stakeholders across Europe, who recognise the importance of digital skills for all, no matter the age, gender or job profile. The majority of pledges aim to bring more digital skills into education by transforming teaching and learning methods. Others support the upskilling and retraining of the European workforce through training. Following a call launched in April 2017, a number of organisations also committed to raise the level of digital skills for women specifically. The majority of pledges come from companies and organisations in the ICT sector or from education and training bodies. 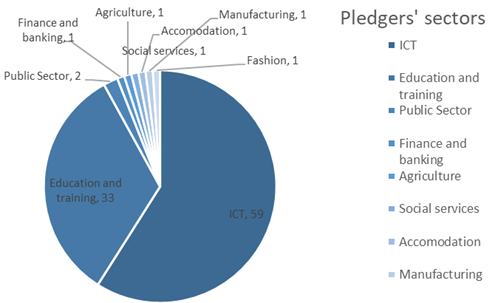 The number of pledges from ICT-using sectors is also increasing. A number of employers from the financial and banking, agriculture, social care, health, and fashion sector already committed to boost the digital skills of their labour force. Members pledged individually or together with other organisations, committing to join forces and carry out collective actions. In the Charter signed in 2016, Members of the Coalition committed to train 1 million extra young people by 2020 for vacant digital jobs by training unemployed and disconnected young people for digital jobs. By the end of 2017, more than 3.7 million trainings were already held by pledging organisations across Europe. These trainings were online or face-to-face and at various levels of digital skills: from basic digital skills and coding, to specialised skills such as data analytics and cybersecurity. More than a million Europeans also had the opportunity to assess and upgrade their digital skills with certifications. Furthermore, several activities focused on offering over 9,000 job placement offers and internships, including remote jobs. Many pledges also focus on raising awareness about the importance of having digital skills in a digital society. 45 of the 100 pledges cover the majority or all 28 EU Members States, whilst 48 are implemented nationally and 7 locally. Most pledges covered Italy (20), Spain (14), United Kingdom (11), and Greece (9). To make a pledge your organisation should first become a member of the Digital Skills and Jobs Coalition and endorse our Charter. Once you are a member you can introduce your pledge here. On the PledgeViewer.eu you can easily identify which pledges are active in your country, get inspired to launch your own pledge and find partners and opportunities for up/re-skilling.